The Air France plane that disappeared between Brazil and France with 228 people on board today has almost certainly crashed, airline and government officials said. If no survivors are found it will be the worst loss of life involving an Air France plane in the firm's 75-year history. The officials believe the Airbus A330-200 aircraft crashed after running into lightning and thunderstorms over the Atlantic Ocean. Gordon Brown said he feared Britons were among the passengers. "I do fear there may be some British citizens on board," the prime minister told Sky News. "We are doing all the checking that is necessary." The Air France chief executive, Pierre-Henri Gourgeon, told a news conference: "We are probably facing an air catastrophe." He said the aircraft went through a thunderstorm with strong turbulence at about 3am BST. An automated message was received at 3.14am indicating a failure of the electrical system, Air France said in a statement. "The whole company shares the anxiety of the families," Gourgeon said. "We are doing everything possible to get information through, little by little, as it comes through." François Brousse, an Air France spokesman, said several of the plane's mechanisms had malfunctioned, preventing it from making contact with air traffic controllers. "It is probably a combination of circumstances that could have led to the crash," he said. Brazilian air force planes are searching the Atlantic for flight AF447, which left Rio de Janeiro at 7pm local time (11pm BST) yesterday. It had been expected in Paris at 11.15am . Brazilian air force officials told the Associated Press a search was under way near the island of Fernando de Noronha, about 1,500 miles north-east of Rio, but an Air France source was quoted as saying that there was "no hope" for those on board. Jean-Louis Borloo, the second most senior figure in the French cabinet, said: "By now it would be beyond its kerosene [aviation fuel] reserves … unfortunately we must now envisage the most tragic scenario." Borloo told the France Info radio station the plane had disappeared from both military and civilian radar screens. The French president, Nicolas Sarkozy, expressed "extreme worry" and sent the junior minister for transport, Dominique Bussereau, and Borloo to Charles de Gaulle airport to monitor the situation. The Air France flight was full – today is a French bank holiday and Brazil is an increasingly popular tourist destination among the French. At midday, the flight was still up on the arrivals board with the word "delayed" beside it, even after official statements said that it had probably been lost. By 1pm, it had been removed from the board. Relatives and friends of passengers who had arrived at Charles de Gaulle's terminal two to meet the plane were ushered into a closed area away from journalists, where they were being counselled by airport staff. A former pilot told France Info he believed the plane was the first passenger-carrying Airbus A330 to crash. The model is known as having a good safety record. The plane was carrying 216 passengers and 12 crew. Of the passengers, 126 were men and 82 were women. Seven children and a baby were on board. According to the French media, Paris airport authorities were told by their Brazilian counterparts that the aircraft had vanished from radar screens. Douglas Ferreira Machado told Brazil's Globo TV that he believed the plane must have left Brazilian waters and could have been near the coast of Africa by the time contact was lost, based on the speed it was travelling. "It's going to take a long time to carry out this search," he said. "It could be a long, sad story. The black box will be at the bottom of the sea." French military aircraft took off from Senegal in western Africa to take part in the search. France Info quoted an airport authority source as saying it was possible, but extremely unlikely, that the radar drop-out had been caused by a transmitter failure. Chris Yates, an aviation expert, told the BBC: "There is not radar coverage across the Atlantic, because it is too far from radar stations. "But the fact [the plane] has not appeared on radar when it neared land gives me cause for concern." He said that "if we are talking about an aircraft coming down over the ocean … then survivability is quite limited". Air France said the pilot had flown 11,000 hours, 1,700 of them on an Airbus 330, making him a highly experienced pilot. Of the two co-pilots, one had 3,000 hours of flight time and the other 6,600 hours. Flight AF447, which had flown 18,870 hours, entered service in April 2005. Its last engineering overhaul was in April. The A330-200 model has not had any fatal accidents involving passengers. In June 1994, an A330 owned by Airbus on a test flight simulating an engine failure on take-off crashed shortly after leaving Toulouse, killing all seven people on board. In October last year, a Qantas A330 flying from Singapore to Perth reportedly experienced a sudden change in altitude. The crew issued a mayday call before diverting the aircraft. About 36 passengers and crew members were injured, more than a dozen seriously. The last major incident involving an Air France plane was in July 2000 when one of its Concordes crashed just after taking off from Charles de Gaulle Airport, bound for New York. All 109 people on board were killed, along with at least four on the ground. - Assuming the wreck is more or less where everybody seems to think it is (close to the West African coast, rather at the northern end of the circle Koen´s map indicates), water depths there vary between 3km and 5km iin the worst scenario, making salvage of the black boxes (FDR and CVR) an expensive and time consuming labour. - If the crash indeed was a indeed an in-flight breakup at cruise altitude then the boxes can be anywhere, the debris will be spread out over a huge area, and the bad weather and water currents can displace them even further, you have to locate them first (for 30 days they emit a sonar audible underwater signal that can be located 4 km; before you ask: They withstand 20.000 ft water pressure). An Air France Airbus A330-200 went missing on transatlantic flight from Rio de Janeiro-Galeao International Airport, RJ (GIG) to Paris-Charles de Gaulle Airport. The airplane carried 12 crew members an 216 passengers. Flight AF447 departed at 19:03 local time (May 31) from Rio de Janeiro (GIG). Last radio contact with the flight was at 01:33 UTC. The crew was in contact with the Atlantic Area Control Centre (CINDACTA III) when the flight reported over the INTOL waypoint, estimating TASIL at 02:20 UTC. (INTOL is an RNAV waypoint located in the Atlantic Ocean, 565 km from Natal, Brazil. The TASIL waypoint is located 1228 kilometers from Natal). At 01:48 UTC the aircraft went out of the radar coverage of CINDACTA III, Fernando de Noronha (which is normal as it tranistioned to an area where such coverage is not present). Information indicated that the aircraft flew normally at FL350 and a speed of 453 kts. The aircraft reportedly went through a thunderstorm with strong turbulence at 02:00 UTC. An automated message was delivered by 02:14 indicating a failure of the electrical system and depressurization. The airplane has not yet been found. The cited auomated message was devlivered by ACARS (Aircraft Communications Addressing and Reporting System, an automated system that transmits data to the company, antiquated - 1970s development - but effective: http://en.wikipedia.org/wiki/Aircraft_Communication_Addressing_and_Reporting_System). According to AF the transmissiion lasted 4 minutes which might mean a lot of system failures were reported (but you cannot trust those early bulletins). - AF has mentioned lightning strike as a possibility. When a metal section of aeroplane is hit by lightning, generally the charge is dissipated throughout the whole fuselage and damage is minimised. Carbon fibre, however doesn't dissipate a charge in the same way. Lightning hitting a carbon fibre panel usually results in sparking within that body cavity..
Whilst aircraft manufacturers go to great lengths to minimise the effects of lightning striking carbon fibre panels it's possible that such a strike could thus cause sparking inside the fuel tanks. OTOH there has never been a lightning induced fuel explosion on a plane using Jet A fuel (1963 a Pan Am 707 was brought down by lightning, an Iranian 747 in 1976, a C-130 in 1978 - however all were fuelled with Jet B = JP-4 ). - Engine Icing leading to power loss and consequently electrical system loss (A330 would then deploy an auxiliar turbine - RAT = Ram Air Turbine - to get power back as this model relies mainly on electircal power to be flyable, especially in a thunderstorm. If all electrics are lost the pilot still has pitch trim for pitch control, and the rudder for lateral-directional control. The pitch trim wheel in the cockpit is connected by cables to the control of the hydraulically powered pitch trim actuator. The rudder system is conventional hydro-mechanical control, with cables going from the cockpit to the rudder actuators. Airbus did an approach and landing using pitch trim and rudder control only on an A320 during flight testing as a company test, in very good weather conditions (this is mentioned in "Cowboys d'Airbus", Bernard Ziegler). But they are very careful not to claim that it would be practical to count on this being possible in service, in real world conditions. But, even though pitch trim and rudder do provide very limited control without any electrical power, it could get ugly pretty quickly if you combined this with the turbulence from a CB. - The plane had a ground incident striking another plane´s tail (A320) with the wing in 2006 and had to be repaired: There is a slight possiblity of latent structural failure induced by severe turbulence due to this repair. All in all, very sad, and we will have to wait years to know what and why it happened. I read that this type of plane had a safety record? what's your experience, will the exact cause be released sooner or later? Not in the sense that it would raise more than very low probability suspicious issues with this accident. Expect a 2 yrs time frame to be a bit underestimated, and this with a major interest from all parties involved to know the reason/cause for *this* one. *Preliminary Findings* (on whatever data available by then) in 6 month. You will have noted that I have not offered much update despite the media reporting all kind of things. If those people just for a moment would think about victims relatives and family that will google anything available at the moment, they would see what harm they are doing potentially, so I will not fall in this trap and speculate here (though I have my theory firm in place by now about what happened) and sit out any new reports until they are confirmed as facts (or at least made extremely credible), I hope you bear with me on this stance. An Air France Airbus A330-200 was destroyed when it crashed into the sea while on transatlantic flight from Rio de Janeiro-Galeao International Airport, RJ (GIG) to Paris-Charles de Gaulle Airport. Last radio contact with the flight was at 01:33 UTC. The crew was in contact with the Atlantic Area Control Centre (CINDACTA III) when the flight reported over the INTOL waypoint, estimating TASIL at 02:20 UTC. INTOL is an RNAV waypoint located in the Atlantic Ocean, 565 km from Natal, Brazil. The TASIL waypoint is located 1228 kilometers from Natal. TASIL is at the border of the Recife FIR and Dakar Oceanic FIR. At 01:48 UTC the aircraft went out of the radar coverage of CINDACTA III, Fernando de Noronha. Information indicated that the aircraft flew normally at FL350 and a speed of 453 kts. A preliminary analysis of meteorological information shows that AF447 crossed through three key thunderstorm clusters: a small one around 01:51 UTC, a new rapidly growing one at about 01:59 UTC, and finally a large multicell convective system (MCS) around 02:05-02:16 UTC. Over a time span of four minutes, starting at 02:10 UTC, a series of ACARS messages were sent -automatically- from the plane. The first message indicated the disconnection of the autopilot followed and the airplane went into 'alternate law' flight control mode. This happens when multiple failures of redundant systems occur. From 02:11 to 02:13, multiple faults regarding the Air Data Inertial Reference Unit (ADIRU) and ISIS (Integrated Standby Instruments System) were reported. Then on 02:13 the system reported failures of PRIM 1, the primary flight control computers that receive inputs from the ADIRU and SEC 1 (secondary flight control computers). The last message at 02:14 was a 'Cabin vertical speed' advisory. The following list is NOT from an official source. accident into the Atlantic ocean on June 1st, 2009. The following data have been approved for release by the French BEA. The route of the aircraft was crossing a tropical multicell convective area at the time of the accident. Failure/ maintenance messages have been transmitted automatically from the aircraft to the airline maintenance center. The above mentionned messages indicate that there was inconsistency between the different measured airspeeds. to remind operators what are the applicable operational recommendations in case of unreliable airspeed indication. valuable information is approved for release by the Investigation Board. Last, and as a general remark for airliners in great height: Most laymen have no clue whatsoever how difficult it can be to manually fly an airliner even in good weather when loaded as this one and at this hight (FL350 = 35.000 ft, a sensible height, chosen to avoid thunderstorm effects like lightning). In this height and given the weight, the minimal velocity that guarantees a flyable plane (Vst= stall speed) and the maximal allowed velocity below hitting the "sound barrier" (actually, when mach buffets start creating instability of air flow over the control surfaces: Mmo) are very close to each other, sometimes only just 10kn apart (stall speed is higher the higher you gly, whereas velocity of sound gets lower the higher you fly, they meet somewhere): Go slower than stall speed, you stall and plummet (high speed stall); go faster than mmo and you might lose control and subsequently break up. This is as difficult (as someone mentioned) "as to try and stand still on a basket ball". This is a situation no pilot wants to face in turbulence, even if the air speed indicators work just fine. I will keep you updated as the investigation progresses. true, but the more spectacular the news coverage the more viewers...as in many cases where quantity seems to be more important than quality. *the zone is a intertropical conversion zone' where the northern and southern touch eachother and form cu-nimbs - cumulonimbi up to 15000 m, the highest ones in the troposphere. The Brazilian AF issued a number of releases earlier this afternoon, indicating that two bodies had been located and retrieved, along with a personal effects and (apparently) small aircraft components. 1.) 0300LT/06062009 Brazilian AF R-99B 6751 departed from SBFN to scour the debris field originally plotted early last Tuesday morning (02JUN2009), in which a passenger seat and a 7-meter long component were later visually sighted by one of the C-130Hs. Brazilian Navy corvette Caboclo is currently carrying out retrieval duties. After collecting the two previously mentioned bodies, the ship´s crew retrieved passenger oxygen masks, a blue-upholstered passenger seat (with serial number) and a large number of personal effects. Cv Caboclo will remain on site to search and collect whatever it finds until late this afternoon and Sunday morning, when it will transfer all that it collected to the frigate Constituição. The frigate will then sail to a point 250 km E of SBFN, when it will launch its Super Lynx helicopter to SBFN with bodies and whatever material was collected by the Caboclo. Bodies and material will then undergo preliminary identification and will subsequently be flown to SBNT. All ppl in the know (minus Don, who died on Saturday: http://www.airdisaster.info/forums/viewtopic.php?f=6&t=2509 for those few here who knew him from either pprune, AD.com, AD.info, airliners.net or fromtheflightdeck) are working together on a Wiki that holds all *facts* about the flight´s history and fate. Due to this strict policy it is not the fastest or the most up-to-date compared to some media, but what you read there has rigourosly been confirmed as fact (if not otherwise stated). As a matter of fact, all airliner manufacturers provide a table of altitude limits for given aircraft weights, and account for moderate and higher turbulence and use of anti icing systems. Aircraft should not be operated above these altitudes due to reduction of stall speeds for the various conditions. - events where speed inconsistencies were encountered in cruise. My POV: It is about tume to have all a/c out there (commercial at least) have a mandatory data link to their companies that transport basic flight data (that the CVR/FDR e.g. records). I know the syndicates area all aginst it, because some pilot conversation meant to be private will end in hands of the company (and, make no mistake, on the long run a pilot complaining about his boss will be fired, private conversation and illegal to tap or not, money always wins), but we have too many cases where the onbaorad devces either were unusuable (unreadable) or simply could not be recovered, as in this case. The extensipn to 90 days ULB is the minimum compromise, but does not really solve the problem, because we will end up not finding the device after the 90 days maybe. after reading this I get a question I never askedmyself before: we're all familiar with the black boxes but why are they the ONLY storage location for comms? correct me if/when I'm wrong but why, as the article suggest, aren't the comms also stored on the ground LIVE? They are not, for the reasons (privacy, syndicates, company politics) mentioned. Also there are some tech probs, mainly for sat connections, as - should the a/c lose it´s "normal" orientation - the sat link would be broken, exactly in this critical phase. OTOH, SW or LW sould also at least allow to transmit basic data, independent of the plane orientation (as longas antennae would be functional, wihich during desintegration would of cause not be the case; still, in this situation the FDR might just record a tidbit longer). I am all advocating having a CVR/FDR on the ground as backup, would help to have the important data in 95% of the accidents. If you have follwed you will know that three deep sea searches have taken place so far that found nothing. OTOH it is not (according to the preliminary report) possible to draw ascerted conlusions without the FDR data, and as everybody fears this "unexplained" (relatively, my take is the speculations have it more or less spot on in resume) hull loss coul happen anytime again. With these parts found (a part of the hull also, containgn perished passengers) at least now the area is rather clear, a big leap forward as it allows relating to the transmitted faioure reports and to narrow the search zone to finally retrieve the FDR and CVR (maybe, NOTE theyre not transmitting anymore after that time). The miracle has happened, and finally both the FDR (solid state memory module separated from its casing but AFAIH intact) and the CVR have been recovered. The separation of the memory module from its casing give you an idea of the forces that were liberated when the a/c struck the surface. Here a presentation of the salvage operation including a map of the debris field. Lets hope that now (they also found two of the sensors that have been speculated on as the culprits) this accident finally can be cleared up fully and measures be taken to avoid it happening again (like maybe reducing the flight level in bad weather, etc). This article sums up the events, the speculations and the consequences pretty well. The Air France jet which crashed into the Atlantic en route from Rio in 2009 stalled and fell in three and a half minutes, French investigators report. The air accident investigations bureau (BEA) found the crew had struggled with contradictory speed readings just before the plane crashed. The BEA statement did not look at the causes of the crash but one theory is that the jet's speed probes failed. All 228 people on board were killed in the disaster. The BEA findings were released in an online statement in response to speculation in the media over the findings from the flight recorders, only recovered from the sea this month. A full report into the disaster is not expected until next year. While cautioning against a rush to conclusions, Air France said on Friday that it appeared "the initial problem was the failure of the speed probes". Since the crash, the air line has replaced the speed, or Pitot, probes on its Airbus fleet with a newer model, AFP news agency reports. Ahead of Friday's statement, the BEA said it wished to correct "partial and more or less contradictory information published in the media". It was giving "factual elements on the operation of the flight that... establish the circumstances of the accident but not the causes". 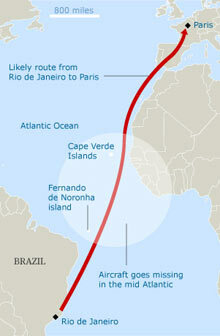 Flight AF 447 went down on 1 June 2009 after running into an intense high-altitude thunderstorm, four hours into a flight from Rio de Janeiro in Brazil to Paris. One of the instruments showed "a sharp fall" in air speed as the plane entered a zone of turbulence, the stall warning sounded and the autopilot and auto-thrust disengaged, the BEA said in its statement. At the time, the captain was taking a routine rest, with the two co-pilots in control in the cockpit. As the co-pilots struggled to understand what had happened, the captain returned but did not retake control. For a period of less than a minute, speeds displayed on the left primary flight display were inconsistent with those on the integrated standby instrument system, the BEA found. French investigators have been working on the theory that the speed probes malfunctioned because of ice at high altitude. This may have set off an unpredictable chain of events. According to the data released by the BEA, the captain was back in the cockpit two minutes and 48 seconds before the crash. Investigators found the composition of the crew had been "in accordance with the operator's procedures". Air France praised Captain Marc Dubois and his co-pilots, Pierre-Cedric Bonin and David Robert, as "three skilled pilots" who had "demonstrated a totally professional attitude and were committed to carrying out their task to the very end". Those on board the jet came from more than 30 countries, though most were French, Brazilian or German. The wreckage of the plane was discovered after a long search of 10,000 sq km (3,860 sq miles) of sea floor. Now I'm not a pilot, but why would one pull up the nose in a stall? And after the stall warning sounds, why would one reduce airspeed? Aren't both of these actions counter productive in a stall situation? Pulling up (relaying to what little I know about the situation, havent read more than 3rd party reports about the leaked FDR and CVR data) is most probalby the way to disaster. But - and for the moment with all the disclaimer mentioned before valid and in mind - I can easily imagine an environment where the lack of consistent IAS or TAS information (or a surplus of contradicting ones), at night: without visual reference, in an aircraft that relies on automation, overwhelmed by what I hear were 50+ sound and visual alarms, a captain coming back from relief and shouting at you, could make it impossible to even realize youre in a deep stall, and less to take the approprioate action. If you go back to the Qantas A 380 mishap that turned out well you will find that the reports stated that they needed *1 hour* to work through all the check lists, just imagine what you can do in 3 minutes if you dont even have correct SITAW (how long to find a checklist for a specific situation at lets say just 1.5 g?). What do you do when you dont know nothing and dont want to go down? Pull up, even if it results to be the most stupid thing to do, its still very human and natural: Airbusses *dont stall* (if protections are valid and you are not in alternate or direct law status, but would you understantd where you are so rapidly? ), so pulling up, for an untrained pilot might be the perfect decision (plane raised some 3000 ft after AP disengage and my spculative guess is that iwas not the AP that did it). 10.000 feet plunge per minute is a fairly high number for a vertical descent, plane horizontal and just rolling, more or less all at 1-1.5 G (but when you see the altimeter spinning down 1 full scale every second - tjub, tjub, tjub, etc. ... what would *you* think!?) you might get the impression youre in a vertical dive if you have no visual reference (and no AoA indicators that work), and the time for the plunge (3 min in total) is simply too short ot get an understanding of facts or even basic situational awareness. Not saying it was so, but that is one of my ideas of what happened (my coffin corner theory of one year ago not discarded yet), we will have to wait either for a full disclosure of facts (BEA did one today that is partial, w/o conlcusions, just facts to counter misinformation that has been interpreted) or the final report (due mid 2012). Once I have read this report I will gladly share my view of an ex pilot. Really, amigos, 3 minutes is nothing if youre out of your depths as a plane driver, I can tell you this for sure and from experience. with Dakar failed". The Captain left the cockpit. around 205 tonnes and 29% respectively. Autopilot 2 and auto-thrust were engaged. added "I’ll call you back as soon as we’re out of it". of turbulence increased slightly and the crew decided to reduce the speed to about Mach 0.8.
displayed on the right side is not recorded. Note 2: Autopilot and auto-thrust remained disengaged for the rest of the flight. At 2 h 10 min 16, the PNF said "so, we’ve lost the speeds" then "alternate law […]". Note 1: The angle of attack is the angle between the airflow and longitudinal axis of the airplane. This information is not presented to pilots. recorded angle of attack was around 4 degrees. From 2 h 10 min 50, the PNF tried several times to call the Captain back. remained in the latter position until the end of the flight. angle of attack being 16 degrees. all of the recorded speeds became invalid and the stall warning stopped. stops, which lasted about 30 seconds. ahead you have the controls". The angle of attack (AoA), when it was valid, always remained above 35 degrees. 5.3 degrees left and a magnetic heading of 270 degrees. ted standby instrument system (ISIS). This lasted for less than one minute. - the engines were operating and always responded to crew commands. 5.3 degrees left and a vertical speed of -10,912 ft/min. I have pondered a bit about what I wrote above (and then edited), but let me give you an interesting insight on how the brain of human pilots, the combination in a crew and the natural reactions of both make an interesting mix (this is not only valid for flying where we pilots had to learn it, but actually for any decision making under constraints). Studies of how experts, such as experienced flight crew, make decisions under constraint show that they use a cognitive strategy that derives decisions directly from the recognition of similarities between current events and past experience. Klein (1998) terms this cognitive strategy Recognition Primed Decision Making or RPD. In RPD current events are compared with previously experience and memorised rules. Recognised similarities are then used to help select appropriate reactions, judgments and decisions. The objective of RPD is above all to quickly find a workable, not necessarily optimal, solution. This leads to the serial consideration of options and in the case of expert decision makers, the need to only consider a couple of options. So in the context of AF 447, the crew would have recognised the combination of anomalies in the air data and system responses (e.g. ECAM warnings) as fitting an ‘unreliable air speed’ pattern and have selected a response on that basis. From the BEA’s study such a response would be equally likely to have been, ‘sit tight and wait for the air data to recover’ as it would have been to initiate a voluntary descent. But when decisions are made under time constraints, heuristics (or rules of thumb) are used that can bias decision makers to sample and process information selectively and subjectively. Two pertinent biases in the context of the AF 447 crew’s responses to unreliable airspeed are confirmatory biasing and cue salience. Confirmatory biasing. In confirmatory biasing having initially formed a theory a decision maker then notices information that confirms the theory but disregards conflicting information. * Potentially evaluate increasing alpha as another unreliable airspeed parameter. Cue salience. In cue salience, cues (perceived events, data and so on) may be disregarded because of their lower salience (attensity) by a decision maker. * stall warnings would have had low salience, given they had been generated by the unreliable air data in the first instance. In RPD experience is the key to making effective decision making, given that pitot icing events were not normally experienced by air crew and only annually trained for this lack of experience in effect limits their expertise. To put it another way flying an aircraft in high turbulence with unreliable air data in the coffin corner (9) is not a scenario that a pilot is prepared for by either training or experience. So, based on what we know about the events onboard AF 447, including estimated terminal velocity at impact, and what we can reasonably infer from the BEA’s study of other unreliable air speed incidents a possible scenario may be as follows. Note that I make no assumption that the event occured whilst flying within the extreme weather of a thunderstorm as previous pitot icing incidents (such as the Air Caraibes incident) have occurred ‘in the vicinity’ of bad weather. The aircrew would have initially responded to the air data anomalies by sitting tight and attempting to fly the aircraft through the event. Due to the use of erroneous air data by the auto-thrust system the engines disconnect, leaving the engines auto-locked with a low N1 value. In turn this results in a speed/thrust mismatch that initiates a slow pitch rate entry into stall, the buffeting of which is misinterpreted as being turbulence by the crew (10). Subsequent stall warnings, decreasing altitude and increasing vertical speed are again mis-interpreted by the crew as due to unreliable air speed. The aircraft departs into a deep stall that then reduces stall noise & kinesthetic cues. Having unknowingly entered into a deep stall the crew may then have exacerbated the situation by control inputs that initiated an unrecoverable flat spin, or a flat spin could have been triggered by turbulence induced yaw. The crew then either fail or are unsuccessful in responding to the stall within the remaining altitude. 1. A high rate of vertical descent with a positive attitude is consistent with a deep stall condition, that is nose high and wings level (Carbaugh, et al. 1998). The aircraft may have also been in a flat spin at the time of impact. 2. In alternate law, alpha protections are no longer available but a stall warning is triggered when the greatest of the valid alpha values exceeds a certain threshold. The highest of the valid mach values is used to determine the threshold. If none of the three Mach values is valid, a Mach value close to zero is used. For example, it is of the order of 10° at Mach 0.3 and of 4° at Mach 0.8 (BEA 2009). 3. These are imediate actions that should be performed from memory, in the case of unreliable airspeed these consist of ensuring that AP/FD/ATHR OFF then flying memorised pitch – thrust settings of the FCOM and QRH. 4. For example five degrees of pitch is the memory pitch value for flight above FL 100 (AirBus) for the A320/330 aircraft. 5. In case of automatic disconnection of the auto-thrust with activation of the thrust lock function, the absence of appropriate manual adjustment of thrust can present a risk of an attitude/thrust mismatch, especially when this disconnection occurs with a low N1 value (BEA 2009). 7. Naturalistic environments may include time constraints, high adverse consequences, competing objectives, poorly defined or structured goals and feedback loops. 8. Given a slow enough pitch rate upon entry into a stall an aircraft may take up a stable ‘deep stall’ attitude with little pitch oscillation and stall buffeting. In a fly by wire flight control direct kinesthetic feedback indicating incipient stall is not available, unless a ‘stick shaker’ function is implemented. 9. The term ‘coffin corner’ is used as per the definition of FAA Circular AC 61-107A.to denote an upper portion of the operating envelope where low indicated airspeeds yield high true airspeeds (MACH number) at high angles of attack, for a given gross weight and G force. 10. Noting that recovery from a spin would itself have been made more difficult given the unreliable air data being presented to the crew. 11. A hazard of large aircraft design is that they can become inertially locked in a developed spin and are unrecoverable without a drag chute, if at all. Carbaugh, D., Cashman, J. Carriker, M., Forsythe, D., Melody, T., Rockliff, T., Wainwright, W., Aerodynamic Principles of Large-Airplane Upsets, Boeing Online Aero Magazine Issue No. 3, 1998. Klein, G., Sources of power: How people make decisions, MIT Press, 1998.